It's the Justice League as you've never seen them before, with a lineup that includes Wonder Woman, The Flash, Black Canary, Blue Beetle, Captain Atom and more! Led by Martian Manhunter, the 'strike team' of fellow Justice League members are on a very special mission when Rafael Sierra and a group of rebels are planning to assassinate Sanobel President Enrique Ramos. Will they be able to work together and stop the rebels in time? 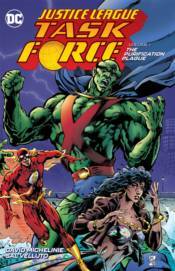 Collects JUSTICE LEAGUE TASK FORCE #1-12.